Made with cocoa, goji berries yerba mate, matcha, chia seeds and coated in quinoa, this made-in-Maine energy bar is bringing brownies back and fueling young entrepreneurial growth. 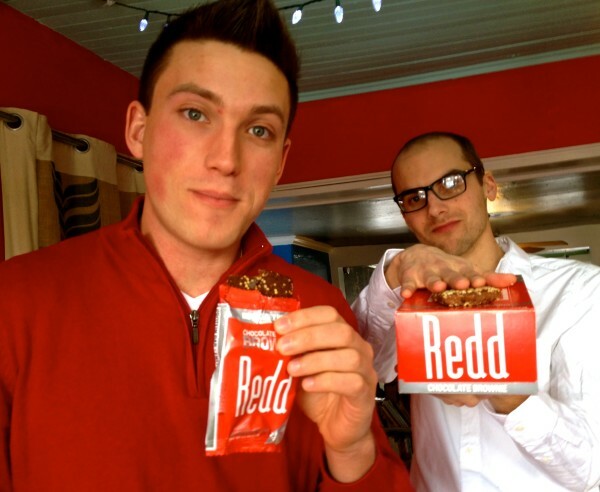 Alden Blease (left) and Reed Allen have created an energy bar called Redd, filled with superfood to power you through the day. This superfood energy bar, Redd, headquartered in Brunswick, is the newest invention to help fuel Maine's growing food entrepreneurial scene. 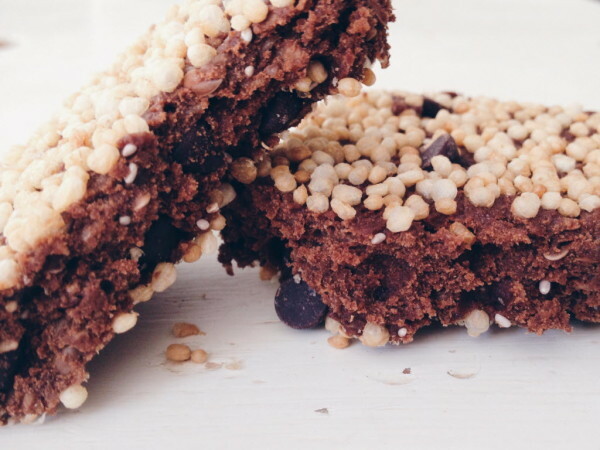 PORTLAND, Maine — “What could be more American than a brownie?” Alden Blease says, nibbling on a healthy version of the baked good at Omi’s Coffee Shop in Portland’s West End. Coated in quinoa and packed with vitamins, the breakfast choice for this 24-year-old is no afterthought. The “indulgently healthy” chocolate brownie, his fourth of the morning, powers the Portland entrepreneur through a work day. Blease is not just an idle consumer of chocolate-accented energy bar Redd, wrapped in a bright red package; he also is company president. “It’s taken a long time to get here,” says Blease, who has the striking looks and well-coiffed mane of the male model he once was. His partner, 27-year-old Reed Allen, at his side in matching red trousers is the chief operating officer of the months-old energy bar company, Redd, based in Brunswick, which aims to bring back the brownie. Why let doughnuts and cupcakes hog the spotlight? “Brownies are relatable,” Blease says. And this one, packed with 50 milligrams of natural caffeine, equivalent to a half-cup of coffee, appeals to outdoor adventurers, brogrammers, athletes and moms alike. 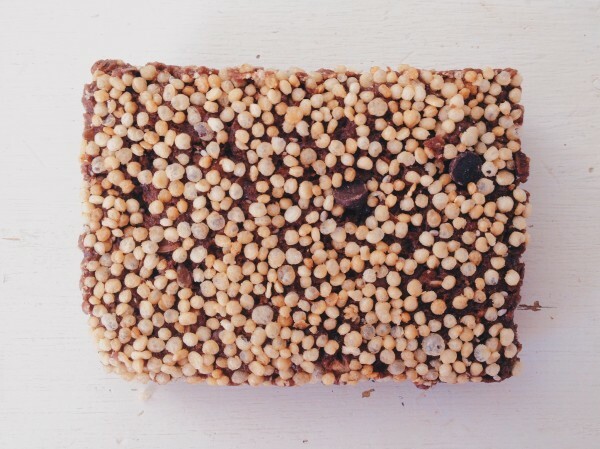 Made with chocolate, coconut juice, goji berries, yerba mate, chia seeds and coated in quinoa crisps, this made-in-Maine energy bar, which tastes like a brownie and is shaped like a Clif Bar, is health food in disguise. “I’ve always been fascinated by superfoods,” says Blease, who took classes in raw food and experimented with bars in the past. When he returned to Maine after a New York City modeling career, he was on the hunt for low-fat, high-energy fuel. His partner, Allen, who lost a kidney at 13 after a snowboarding accident, also was bent on fast, healthy fare. The pair met at a health food store in Freeport, and the idea sparked. “Maine harbors a spirit that brings out creativity,” says Allen, a Sebago native, who handles branding and imaging for the startup and focuses on ways Redd can stand out in a blooming sector. Economic indicators, from marketing company NDP Group Inc. to specialty food groups, are on Redd’s side. Healthy and convenient snack bars were listed as a top food trend this year, according to the New York-based Specialty Food Association. “Companies are pursuing new and untapped markets with these innovative products, touting health and convenience as big drivers for sales,” Specialty Food states in a news release. Blease and Allen, recent graduates of Maine Center for Entrepreneurial Development’s Top Gun program, feel strongly their brownie 3.0, sold in Whole Foods and numerous cafes and stores from Boston to Bangor and as far west as Pennsylvania, could take the fast-growing snack bar segment by storm. Seems the future of healthy snacking is in bar form. For now, the bars, which retail for $1.99 to $2.99, are manufactured in a co-packing facility in Bath. But shipping ingredients such as chia seeds to Maine is costly. This poses an obstacle in producing the more than 30,000 bars a month needed to attract larger clients. 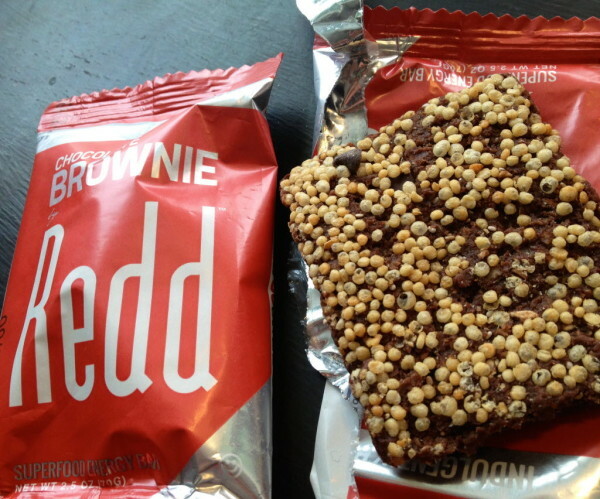 “A move is probably inevitable without a large capital investment in the manufacturing facility,” says Blease, who wants the brownie to be certified gluten free. At present, Gagne Foods, the biscuit company that produces Redd, can only do small runs and probably is not the best fit for a gluten-free product. While the company takes off, headquarters will always be Maine. Despite the fact that Blease considers Maine an “adverse place to do business, because we are at the end of the supply chain” — and ranked 49th for business by Forbes — the owners are proud to call Maine home, citing L.L. Bean as an inspiration. It’s that kind of positive energy that is turning the economic tide in the state, business influencers say. For entrepreneurs coming of age after 2000, success and healthy lifestyle are important. Maine, lacking corporate jobs but promising fresh air, fun and trees, delivers. “We are in the early stages of a turnaround in Maine, and part of the turnaround is attitudinal,” Gooding says. “Young people believe they can build substantial companies here. It’s a very different line of thinking than you see in the press,” Gooding says, adding that Redd’s enthusiastic leaders are a textbook example of that change. To sustain them, MCED’s entrepreneurial acceleration program, from which the Redd team graduated last year, is there to help. Top Gun, now in its sixth year, sets startups with mentors in the community to assist in funding and navigating the pitfalls of early stage growth. Redd received a $5,000 grant from the Maine nonprofit Libra Future Fund, a $10,000 loan from Coastal Enterprises Inc., $11,000 from a credit union and $20,000 from private investors. Unlike Manhattan, where you are lucky if you run into the same person twice, the men find the state’s cohesiveness a plus. Blease’s mother, Heather Blease, is a part of that community, too, as the founder of call center EnvisioNet and leader of SaviLinx, both based in Brunswick. “The business community is so small, people are willing to help each other out,” Blease says. Gooding, who is optimistic about Redd’s future, is one of them.